Wonderful end of term news! 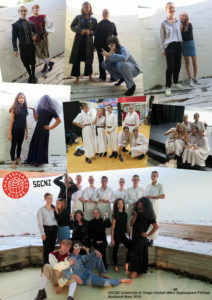 A huge congratulations to Amy Morrin, Hattie Salmon, Niamh Maher, Sian Azariah, Grace Thevenard and Sienna Davidson, Y13, for winning the SGCNZ University of Otago Sheilah Winn Shakespeare Festival – Best 15 minute, Student Directed scene for their evocative performance compilation of Shakespeare’s Titus Andronicus at the Auckland West Regional University at Kristin School on Tuesday 2nd April 2019. The award for best 15 minute scene is a highly coveted award of the New Zealand regional festivals and we are very proud of these girls for their incredible creativity and direction. It was marvelous to be in the audience with Robert Pollock and Beth Kayes to celebrate in their success. For these students their journey in theatre at Springs and with Sheilah Winn over the past five years has been exceptional. Titus opened a moving compilation of scenes in song and all students had such presence on stage dressed in contemporary costume – the audience was truly captivated. The team will continue rehearsal in preparation for the National Festival held over Queen’s Birthday weekend at the Michael Fowler Centre, Wellington, where they will again perform their scenes alongside other New Zealand regionally selected schools – we wish them all the very best and look forward to seeing this breathtaking performance again. 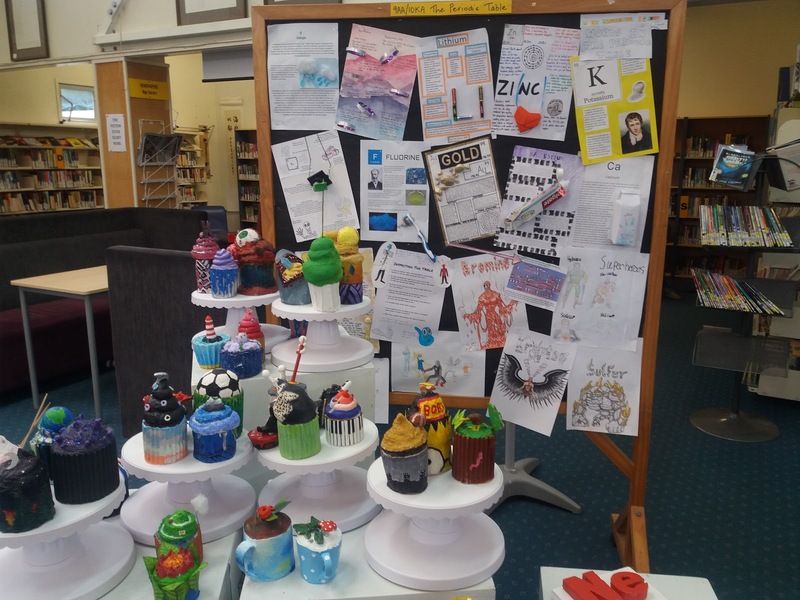 Following on from their success, we’d also like to recognise the efforts of all students who were involved. Special mention this year goes to Alice Naish and Isobel Christie for their involvement in Richard III Act I, scene iv – they were awarded Best Connection between Two Performers. Alice Naish also received a special mention for her individual performance. Students dedicate a lot of their own time over the term to rehearsing excerpts of Shakespeare in preparation for the competition. On behalf of Robert Pollock, Beth Kayes and myself – well done to all and we are very proud of you. Thanks to Una Schenker – 13Art Design – for the ArtsNews Heading in this issue. 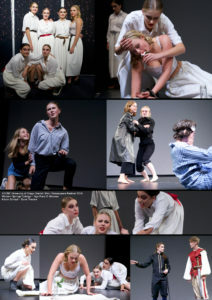 It’s been a busy term as always with Drama at WSC. The year 11 students have just completed their assessment for the Theatre Form standard looking at Elizabethan theatre and in particular Romeo and Juliet. This is a practical presentation worth four credits. We have now begun work on their major production, which they will perform to a public audience in the last two weeks of term 2. This year the play is Macbeth the Comedy – same plot as the tragedy version, but with a happy ending! Year 12 has been flat out completing both the Techniques and the Theatre Form standards, worth a total of 8 credits. Again both are practical assessments. They are now working on their production, which they will perform in weeks 2 and 3 of term 3. The play is The Judas Zoo, by Gary Henderson; a gritty prison drama set on a satellite station in 2045. 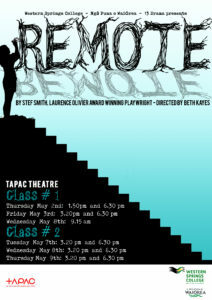 This will be a must see and something wildly different from their show last year. 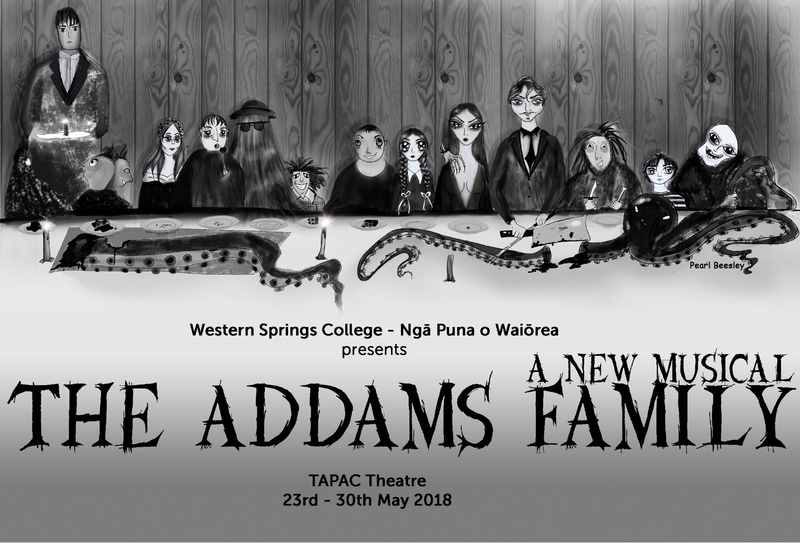 As always all performances will be in the TAPAC Theatre – see you there? The first NCEA performance assessment evening was held last week. A huge congratulations to the yr 11 students who performed. What an amazing display of musicianship, determination and pride. Performance evenings are held in the music room and start at 5 pm. Practice rooms are available at interval and lunch for all students to work on their music. See Margaret or Daniel at the beginning of each week to book a space. Calling all saxophone, clarinet and trumpet players – Jazz Band wants you! Please see Margaret about this, you can be a beginner at playing jazz, we’ll help you out. Orchestra is well underway and sounding fabulous. We have a cello section of six players which is unheard of. Here they are hard at work at a before school sectional The NZ Music Commission runs a mentoring programme in schools which involves NZ musicians coming into schools to work with students towards identified goals. We have been successful in our application to the programme! 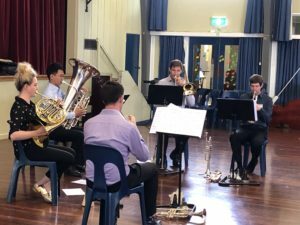 Next term Tommy Nee will be coming in to work with a group of students helping them as a band compose and perform two or three pieces of music. 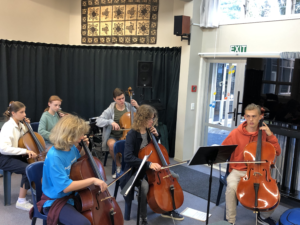 As part of this year’s partnership with the Auckland Philharmonia Orchestra we have had our first visit from an ensemble. 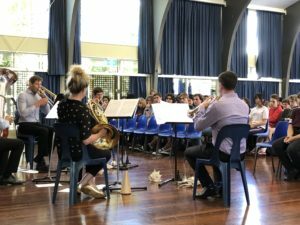 Around 80 students were treated to a highly energetic and very polished performance by a Brass Quintet from the APO – 2 trumpets, a horn, a trombone and a tuba. Before the quintet our own WSC/NPoW orchestra, conducted by Trina Sellers, played an arrangement created by our own yr 12 student Sophia Reay. The professional musicians from the APO were full of praise for the orchestra and for Sophia. Next term the yr 11 music students will head into town to an APO concert in the Town Hall – IF THEY GET THEIR PERMISSION SLIPS IN!! We will also have a visit from the Claude Bolling Jazz combo and from Aucktet – a group made up of 8 trombones. We are delighted to be working with the APO in this ownership.